Saint George and the Dragon is a 1984 children’s book adapted from Edmund Spenser’s Faerie Queene by Margaret Hodges and illustrated by Trina Schart Hyman. It received the Caldecott Medal for illustration. Here, the princess Una recruits the Red Cross Knight to battle the dragon that threatens her country. This is a surprisingly wordy little book, although this is in all likelihood by necessity given the level of faithfulness to the source material (Hodges also includes a couple of lines directly from Spenser). Hodges tells the story with ample description and impressive drama; while this helps make it compelling, the book may be too advanced and too intense for small children who are attracted by its short length and big, colorful pictures (there’s also a not-insignificant amount of blood illustrated). The unequivocal highlight of this book is Hyman’s art. She has illuminated the pages, using the margins both to supplement the distinctly English setting and for storytelling. Her illustrations are thoroughly wonderful: her characters, faces, her use of color and shading, her sense of setting, her inclusion of native English plants, her attention to detail – they’re all fantastic, and every inch of every page is worthy of attention. 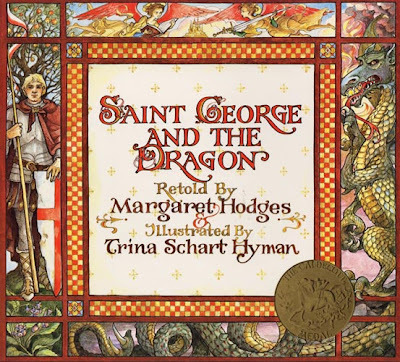 On the whole, Saint George and the Dragon is a very satisfactory telling of the legend, and one of the most gorgeous children’s books you’ll ever find.